Just south of the entrance to the Anton Martín metro stop lays one of the real treasures of the Madrid film scene, Cine Doré. As you walk down Calle de Santa Isabel, the facade of this old timey theater will no doubt make an impression over the other buildings on the street. Built in 1923, the theater boasts a standout brick-orange facade, accented with white columns and pretty adornments. 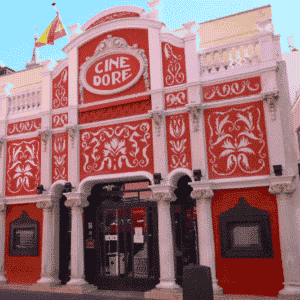 Cine Doré is the hub cinema of the films shown by la Filmoteca Española, a program of the official Ministry of Culture of Spain, whose objective is to research and preserve the cinematic history of Spain. The theater shows films of all genres on a daily basis. There are three theaters, or “salas” en Español. Sala 1 is the original retro theater, restored to a completely functional state. This is the true sight to see, seeing a movie here will really make you feel like you’ve stepped back in time to the early 20th century! Cine Doré also has a more modern traditional theater, Sala 2. And to top it all off, if you’re in Madrid in the warmer months, you have to check out Sala 3, the open air theater with communal tables and chairs, complete with bar service! The best part about Cine Doré? The incredible prices! A ticket is €2,50, but with a student card is just €2! They also run discounted deals on packs of 10 entrances. Here you can find this month’s schedule of films. Pay close attention, because titles are changing every day! You never know what you might be able see on any given day. 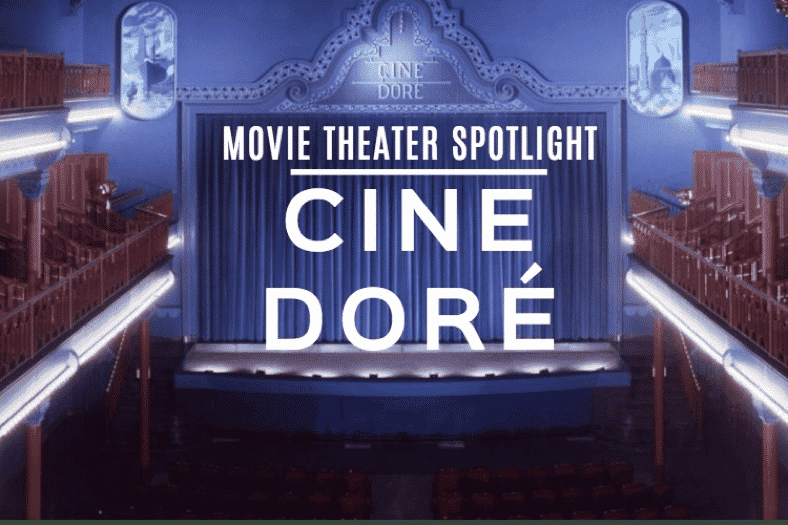 International films, big budget blockbusters, anime, silent film, and more can be found at Cine Doré. Want to learn more about the cinema system in Madrid? That’s great! Take a look at our run down of everything you need to know about Madrid’s Film Scene and take a look at another one of Madrid’s oldest theatres, the Cine Ideal!